Silver Chatter: The First "Revere Bowl"
In honor of our nation's birthday, this seems an appropriate topic for a silver-related blog. The term Revere bowl brings to mind a bowl with simple, classic lines. 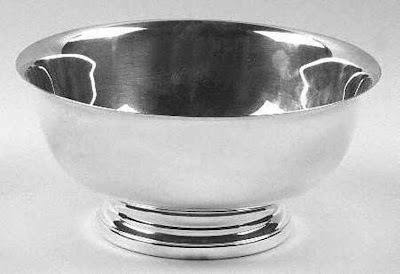 Although I think of a Revere bowl as being made of sterling, or at least silver plate, bowls of this shape have been made from many different materials. We know that Paul Revere was a silversmith so the connection between his name and a silver bowl is natural. But where did the design really originate? The bowl honors ninety-two members of the Massachusetts House of Representatives who refused to rescind their letter sent throughout the colonies protesting the Townshend Acts of 1767, which taxed tea, paper, glass, and other commodities imported from England. This act of civil disobedience by the "Glorious Ninety-Two" was the first public act of rebellion against the British crown and a major step leading to the American Revolution. You can find much more information about the bowl and many pictures at the museum link above. May we all have a joyous and safe Fourth of July! This bowl is beautiful... simple yet stunning. The lines are beautifully proportioned! Love it!